Who among us doesn’t want to save money? The challenge is figuring out what to cut in order to free up those funds, especially when money’s tight. Enter these apps and tools, which can help you save every time you shop, negotiate down your monthly bills and get rid of subscriptions you never use but still pay for. The best part is: They’ll do most of the work for you. So you can set it, forget it—and save. You’re likely overpaying for your cell phone, cable and other services, but changing that means researching competitive offers and investing time and effort to get the right person on the phone to negotiate the price down. 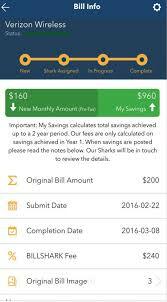 Or you could just send your bills over to Billshark for free via its app, and its reps will do the work for you. Billshark claims an 85 percent success rate negotiating bills for satellite TV, phones, cable TV and Internet, satellite radio and home security—saving some users hundreds per year. In return, it takes 40 percent of whatever savings it’s negotiated. That’s pretty steep for something you can probably negotiate yourself if you’re willing to put in the time and effort. But if you’re not likely to to do that, this sure beats nothing. Savings vary depending on what you’re buying, but you can count on at least a few bucks each time the pop-up appears. It’s also helpful for travel, since it not only works with retailers, but hundreds of airlines, too. It pays to search for coupon codes before completing an online purchase, but that’s usually pretty time-consuming. Plus, you might scour various sites, only to find none of the coupons actually work. Enter Honey. This free browser extension for Chrome, Firefox and Opera sources coupon codes on your behalf—from retailers like Amazon and Walgreens to J.Crew and DSW—and determines which one will save you the most. 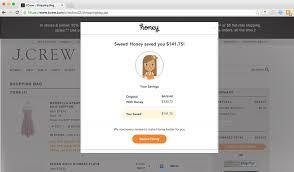 Depending on what deals are available when you’re shopping, Honey can potentially help you score free shipping, 30 percent off your order or bigger savings.